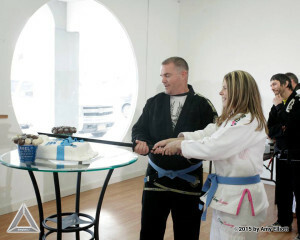 Jiu-Jitsu makes everything better, so why not combine it with a wedding ceremony? 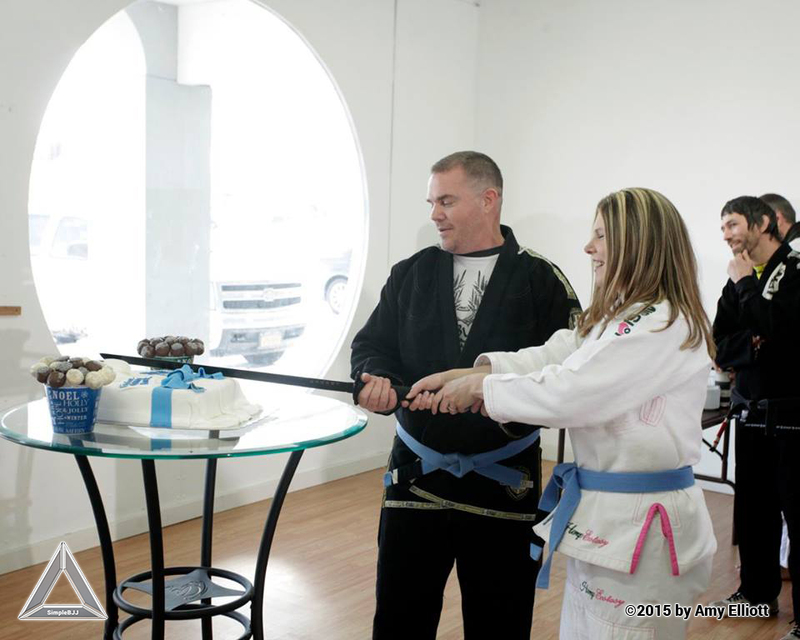 Last week I was asked to officiate a marriage between two blue belts who fell in love at the academy. I was also given free license to run the ceremony however I wanted. This proved to be an irresistible concept, so with a weeks notice I put together a jiu-jitsu oriented wedding ceremony that I’m very happy with. We rearranged the academy mats to create an aisle and competition area, placed the best man and maid of honor at the corners, then had the bride and groom step on the mat competition style. 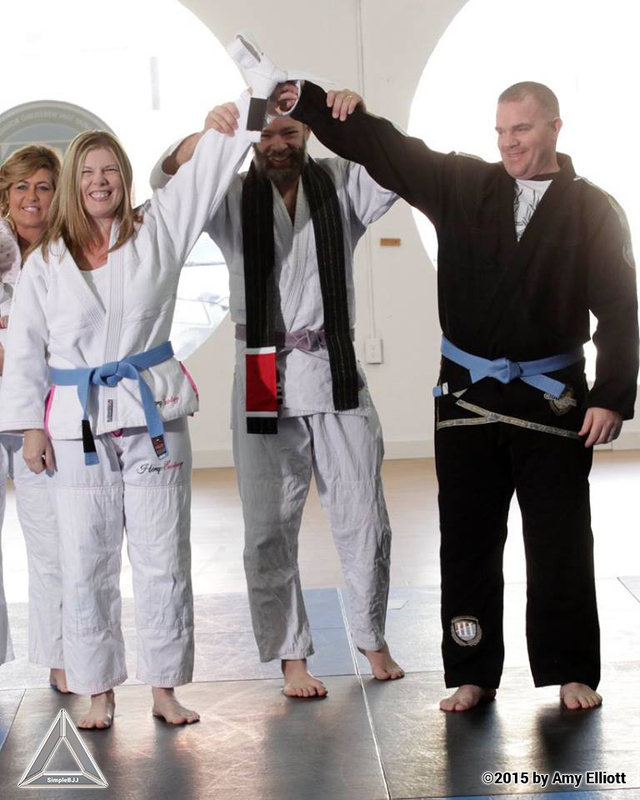 I wore my marriage black belt over my shoulders (sewn a few nights before), and they got their marriage white belt at the end. After the ceremony, they had their first roll, then of course a dollar roll. It was, by far, the most fun I’ve ever had at a wedding. The enjoyment of Jiu-Jitsu has a way of permeating all that you do, and you easily form meaningful friendships with kindred spirits on the mats as you trust and train with your partners. Although romances are often discouraged due to awkward breakup scenarios (usually the female leaving the academy), some matchups result in a deep and committed relationship between two people who share something that helps with all other aspects of their life. 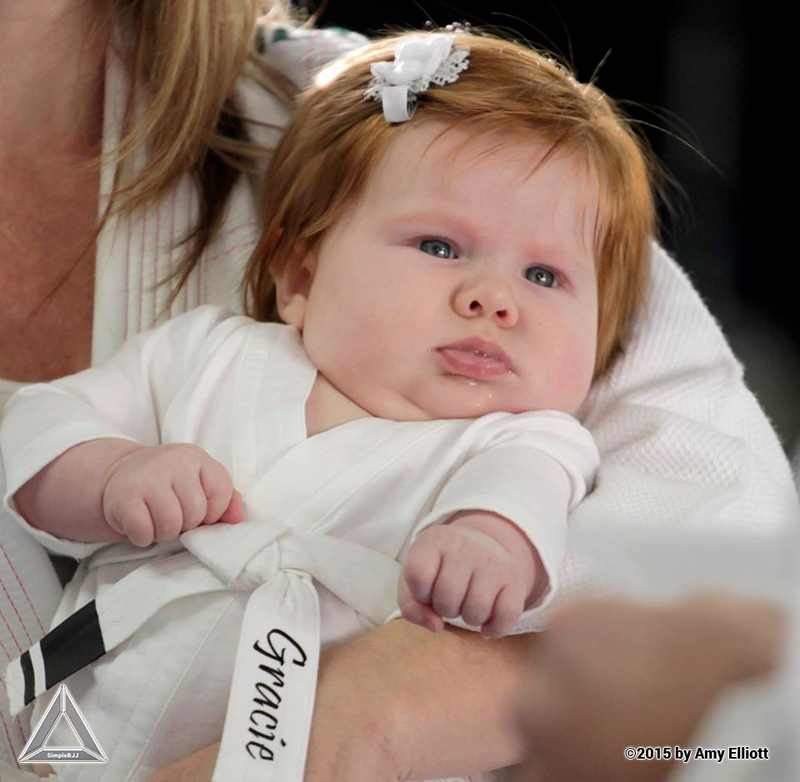 Shadrach and Danielle already have a baby girl that they named Gracie, further indicating the importance of Jiu-Jitsu in their lives. I have trained with them from the first day they came to the academy, and it was an honor to be a part of a wedding between two dedicated practitioners. Below is the video and transcript of the ceremony, which says everything that needs to be said about this Jiu-Jitsu wedding. Welcome, Jiu-Jitsu people and non-jiu-jitsu people. We are here to celebrate the marriage of Shadrach and Danielle. This is a particularly special wedding because it is between two jiu-jitsu practitioners. Both are blue belts, and I can personally attest to the skill and character of each of them. As you all know, I often draw parallels between jiu-jitsu and life. This is because life and jiu-jitsu reflect each other, and a fuller understanding of one helps you to understand the other. Shadrach, Danielle, marriage and jiu-jitsu are particularly related. I have learned many things in jiu-jitsu and in marriage that I want you to take to heart as you continue this intertwined journey that should last the rest of your lives. To succeed in both, you must be direct and honest. You must acknowledge and respect both the strengths and weaknesses of your partner. You must encourage your partner to excel and to follow their dreams. You must be open to new ideas and new challenges, even if they invariably make you uncomfortable and push you out of your comfort zone. You must be willing to take calculated risks for uncertain payoff. There are no rewards for coasting. Stalling is penalized. You must constantly better yourself, always striving to be better than the day before. You must uplift your partner, because without them, you have no purpose. You must commit to all you do with all your heart. When you are wrong, tap early. In all these things that make for successful jiu-jitsu and successful marriage, there will be failures. There will be setbacks. There will be unintentional hurt and pain. There may even be unjustified anger and even moments of rage. Things will sometimes seem unfair. 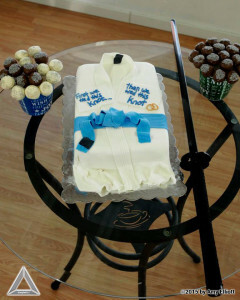 How you deal with these challenges will define both your jiu-jitsu and your marriage. You must have faith that these setbacks are temporary. You must remember that in marriage, love conquers all, and in jiu-jitsu, dedication will let you push past any setbacks. Both true love and dedication are immune to the winds of the day. They are a compass that always points to the future, ignoring any gusts of challenging winds trying to sway you from your path. Jiu-Jitsu and marriage are not meant to be temporary. They are a way of life that is dedicated and committed to exploring all their intricacies for the rest of your life. 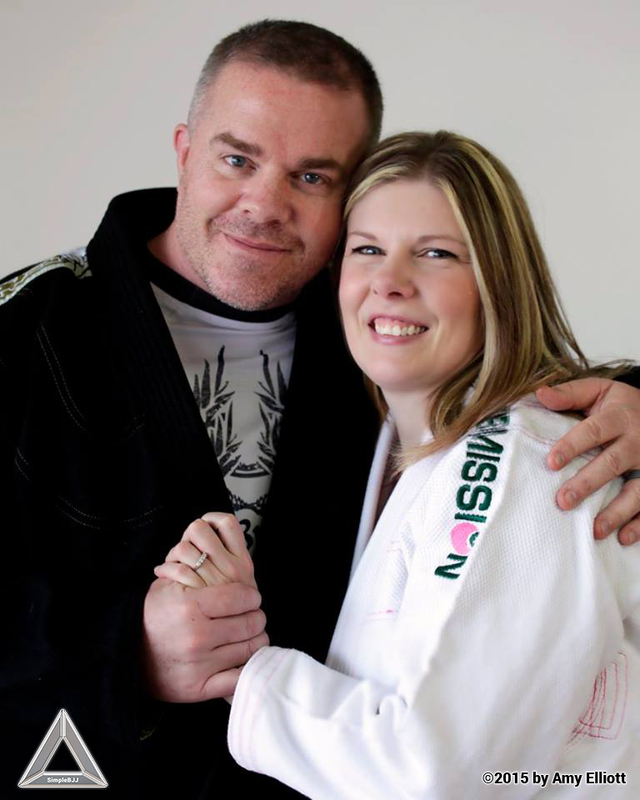 Make your marriage and your jiu-jitsu a shining example for others. Be conscientious in all you do, no matter how big or how small the task is or who the audience is. You can’t predict the impact you will have, so live your marriage and your jiu-jitsu as if they will be an inspiration to others. With that, I ask you to pledge your love commitment and support for each other. Shadrach: I promise to love you always with my whole heart in the best way I can possibly do. I love you. I take you as my wife. Danielle: I had completely given up on finding love. I didn’t think it was ever going to happen for me. I didn’t think I was ever going to have a family. You make me the happiest woman in the world. I love you so much and I take you as my husband. Paul: Of course and just as important is to choke each other and take each other as jiu-jitsu partners for life. 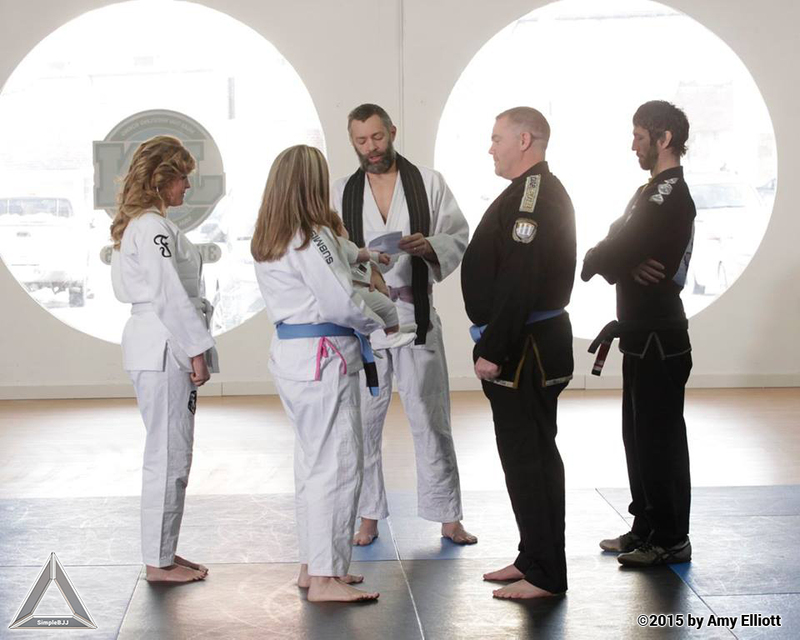 We are all witness to these solemn vows, and as a symbol of the binding of these lives together, I will bind them together with the symbol of a new student, a white belt. This symbolizes both a blank slate, as well as the acceptance that there is much to learn about the art of marriage. 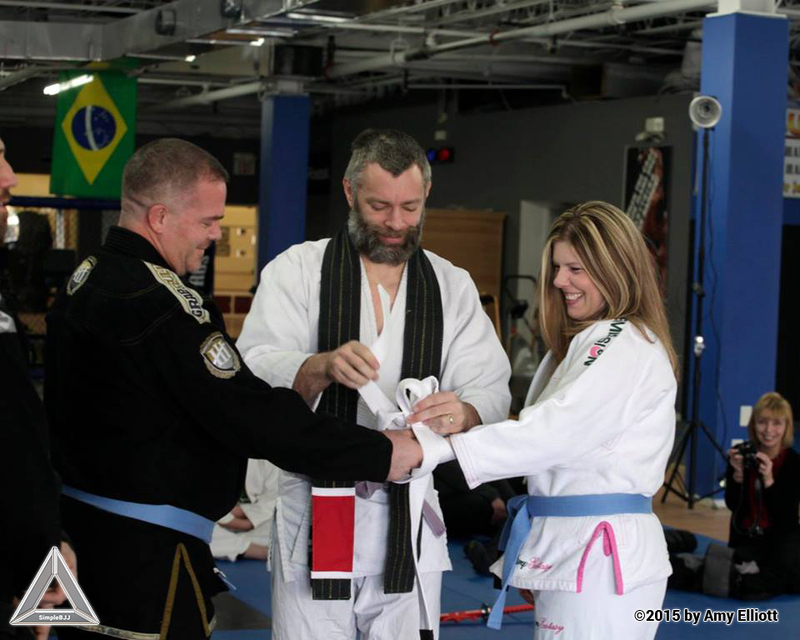 Just as it takes many years of dedication to become a jiu- jitsu black belt, it takes many years of dedication to become a marriage black belt. My own marriage of nearly 22 years is what qualifies me for my marriage black belt, and I can honestly say that a each stripe on this belt can take a year. If you do the math, that’s about 20 years before you’re qualified for your black belt in marriage. It’s a life long thing. I am very happy to announce husband and wife, Dr and Mr Miller. P.P.S. My talented wife is a great wedding photographer as well as my jiu-jitsu student. You might be able to talk her into coming along and photographing your wedding, especially if it’s near a beach.